We has been rainy and overcast most of the week, so I hoping for some sun for the Canada Day long weekend. I am trying to make way through my supplies again, and to pull out stamps and supplies that have been neglected. So I used the DP that was in my scrap bin and this unused little stamp set that I had found at Michaels on the G-Studio rack. 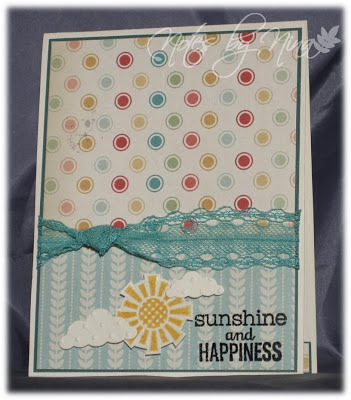 I fussy cut the heat embossed sun and used die cut for the clouds. 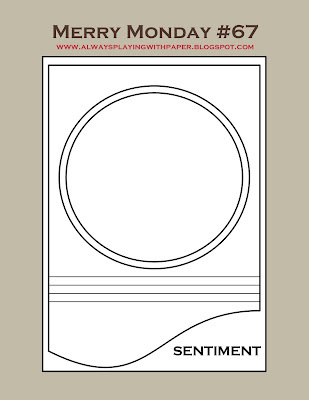 The sentiment is also embossed. 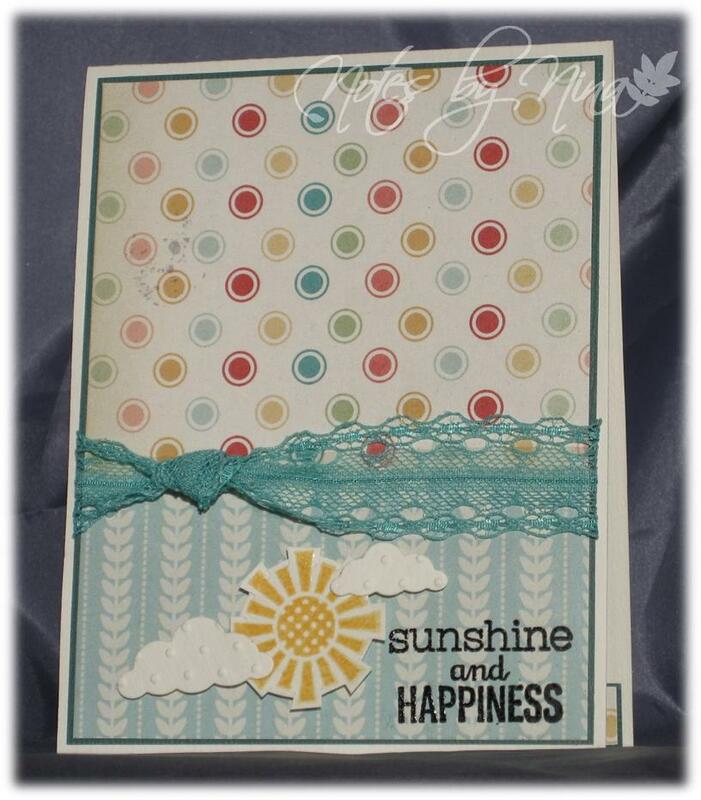 Supplies: Cream and turquoise cardstock, Designer Paper - Authentique, G-Studio stamps, Memory Box-Puffy Clouds, lace ribbon. Happy Wednesday everyone, my sister Barb grabbed the reins this time around for a new family technique challenge. 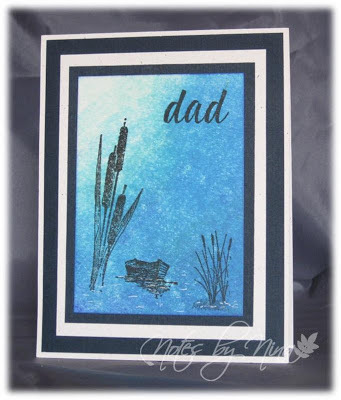 This time around we are using a video tutorial created by Card Crafty Club using bleach. I dug into my scrap bin for supplies, I used a dark brown card stock and some left over designer paper. I heat embossed the images in black before using a small paintbrush to apply the bleach. I found my aqua painter was too thick and I did not have as much control. I wanted to add some ribbon but I could not find anything I vast supplies that I was happy with so I finished with some cream coloured pearls. Supplies: Cream and brown card stock, Designer Paper - Authentique, Verve - Birthday Phrases, Technique Tuesday-Green House Society Feb 2013, pearls. 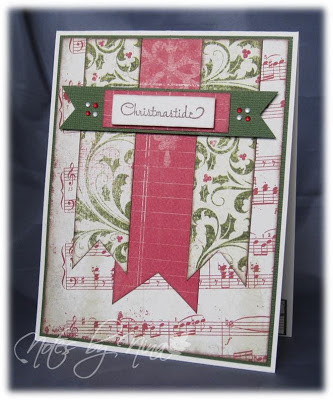 Stop by Barb and Judy's blogs to see what projects they have created using this same technique. Here we are the the last monday in June, this month just seems to zoom on by. We have a new Merry Monday Challenge for you, Lesley is so great with these Sketches. 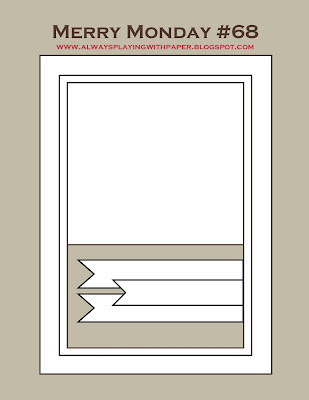 I used a few layers to created a frame using a mix of gray, white and green/blue cardstock to match the designer paper. These colours worked great for the flags as well. I finished with snowflake and small gem. 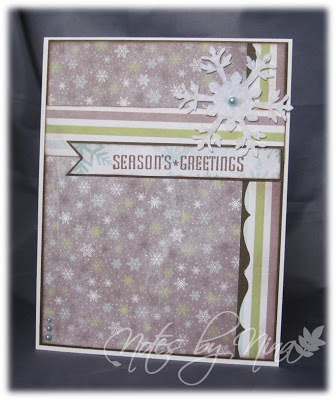 Supplies: Natural white, green\blue and gray card stock, Designer Paper-Fancy Pantsy, Cornish Heritage Farms - Vintage Christmas, snowflake punch, gem. It has been awhile since I joined in the fun for Seize the Birthday, so I spend a little time with my craft supplies last evening. 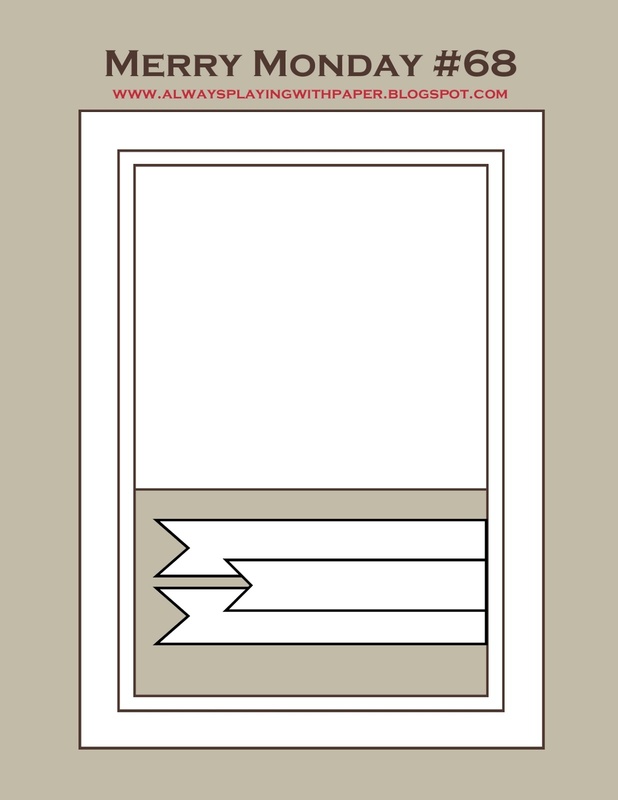 I was determined to use this double sided paper for something, I pulled it out of my stash weeks ago and I would see it whenever I sat down to craft. 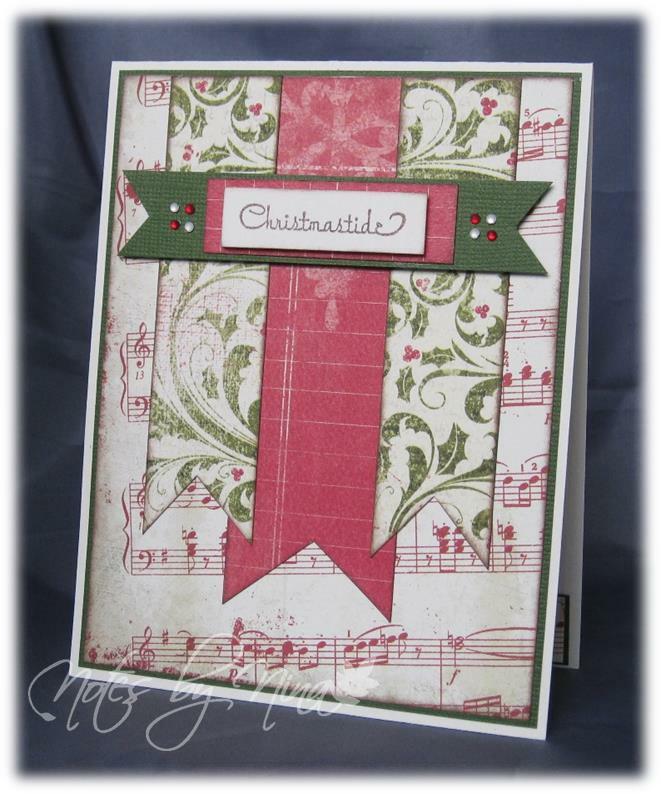 It was the same with this cute little Studio G stamp set I picked up at Michael's awhile back. I heat embossed the party hat with clear embossing powder then cut it out and made the pompom from Flowersoft. I used a small texture stamp to add a little colour to the panel before popping up the hat with foam tape. I stamped the sentiment in black and finished with some tiny pearls. 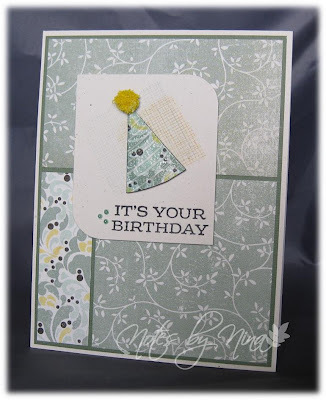 Supplies: Natural white and aqua card stock, Authentique- Spring, Studio G stamps, pearls, Flowersoft. Family Challenge #4 - Let's try ghost stamping. Even with their busy schedules I managed to talk the ladies into doing another Family Challenge. I chose what looks like an easy and fun technique. I saw this video by Jennifer McGuire on using what she calls ghost stamping so I wanted to give it a try. 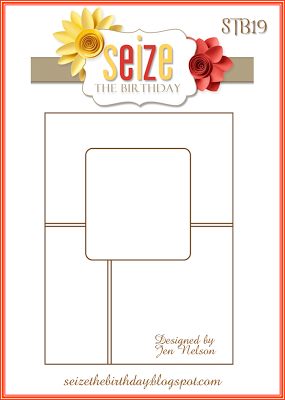 I decided on a similar design as to that in the video, I played with this card for well over and hr :) so much for CAS. I love buttons but I tend to make paper buttons rather that the real thing so when I saw this stamp set I knew I had to have it, I just have not used it as much as I should. I pretty sure we can all say that about large amount of our beloved stamps. 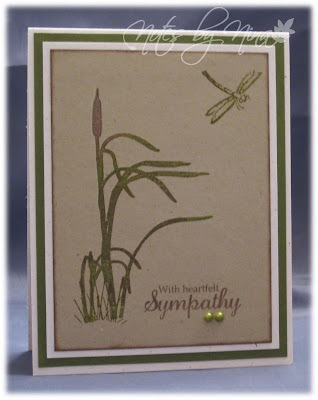 I stamped with Stampin’ Up! white craft ink then used Memento Lulu Lavender and Grape Jelly over top, I dug into my stash of embroidery thread for a coordinating colour. I stamped the sentiment in black. Stop by Barb and Judy’s blogs to see how they have been inspired by this video. Supplies: Natural white, purple and kraft card stock, Verve-Sunny Days, misc embroidery thread, pearls. I had some time to craft a little yesterday, I will post those cards later this week but I have this one to post first. I was going to make this all complicated and use a list of techniques but in the end I thought simple would be best. I did try ghost stamping but somehow I was able to stamp the darker colours in almost the exact spot of the light colour, like that ever happens when you want it too. I inked up the edges a little and finished with a few pearls. 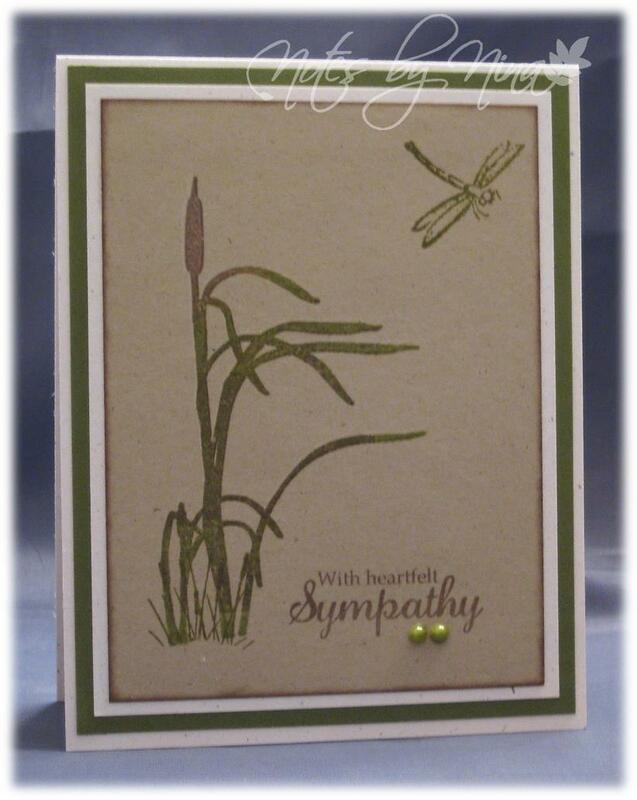 Supplies: Natural white, green and kraft card stock, The Greenhouse Society-Greenhouse 6-12-2012, Stampscapes Reeds, misc dragonfly, pearls. It is Merry Monday time again, Lesley has another great sketch for us. 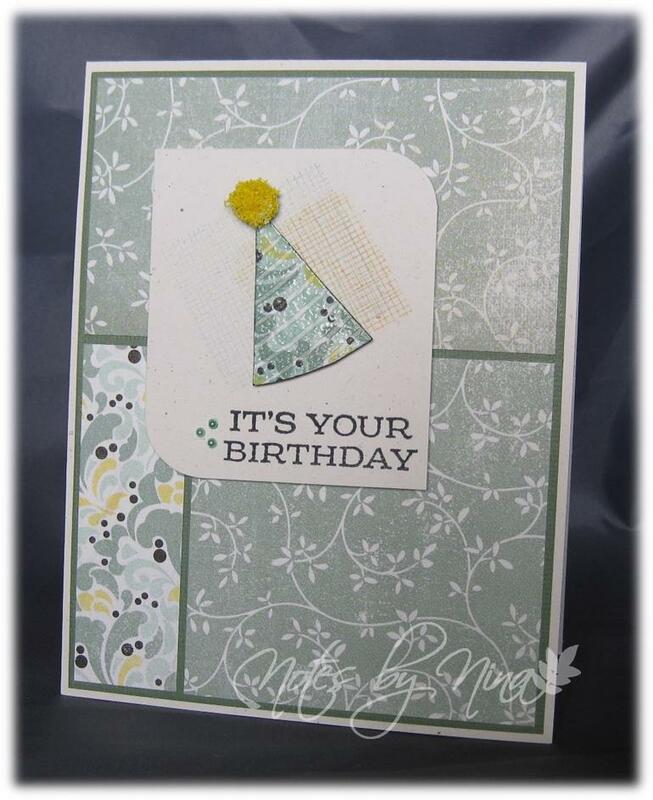 I have had this circle stamp in my supplies for a long time and this card worked perfectly for it. I found this DP in my scraps and I love this ruffled ribbon too. 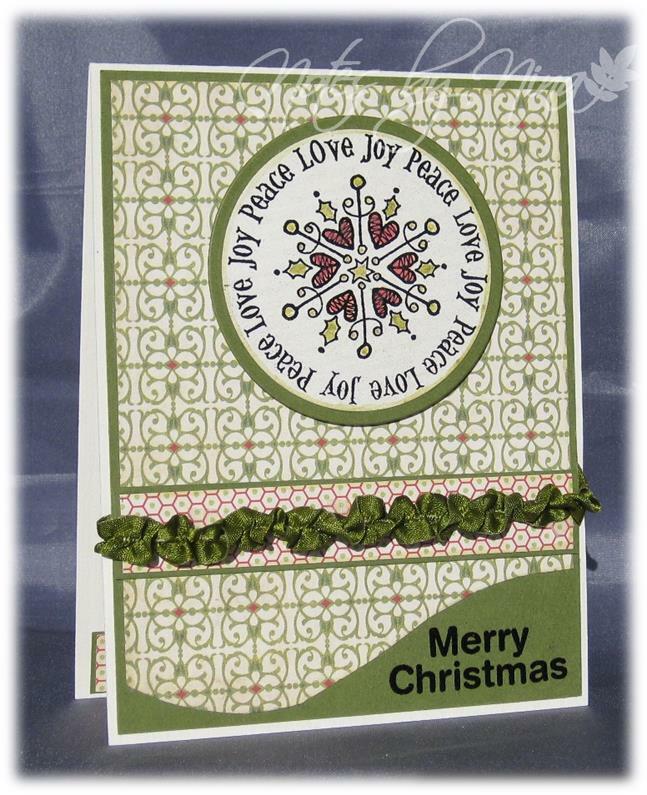 Supplies: Natural white, green card stock, Designer Paper- Unknown, Inkadinkado - Joy, Peace, Love. My crafting was halted yesterday after a call from my son, I was able to spend a wonderful afternoon with him even if it was to do some running around. It was followed by a wonderful Father's Day dinner. I have the house to myself this morning as my husband zooms away for a nice long ride on his motorbike. This is the card I made for him, I used Microsoft word for all the elements. I found a great map of BC and imported it and removed the colour. I created the arrows using the shape tool and used a white pen to add the lines. 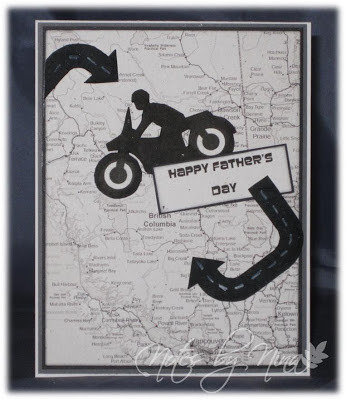 The motorbike is clipart that I fussy cut and I finished with a sentiment that I typed with a fun font. The arrows are popped up with foam tape. 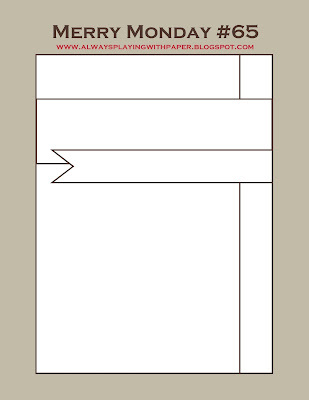 Supplies: Natural white, gray and black card stock, misc map of British Columbia, clipart, shapes and font Microsoft word. Happy Dad's Day to all the father's out there. I had some fabulous creative time this week and made some wonderful cards which were promptly popped in the mail... vacation warped my mind because I forgot to take pictures of about 3 of them :(. Guess that means I will have to carve out more time to card so I have something to blog. This was a first attempt at a card for my Father in Law but my husband was not enamored with it, the second attempt was one of those that was mailed right away. Used a brayer with watercolour paper for the background then just stamped the images and sentiment in black and added a few white lines. 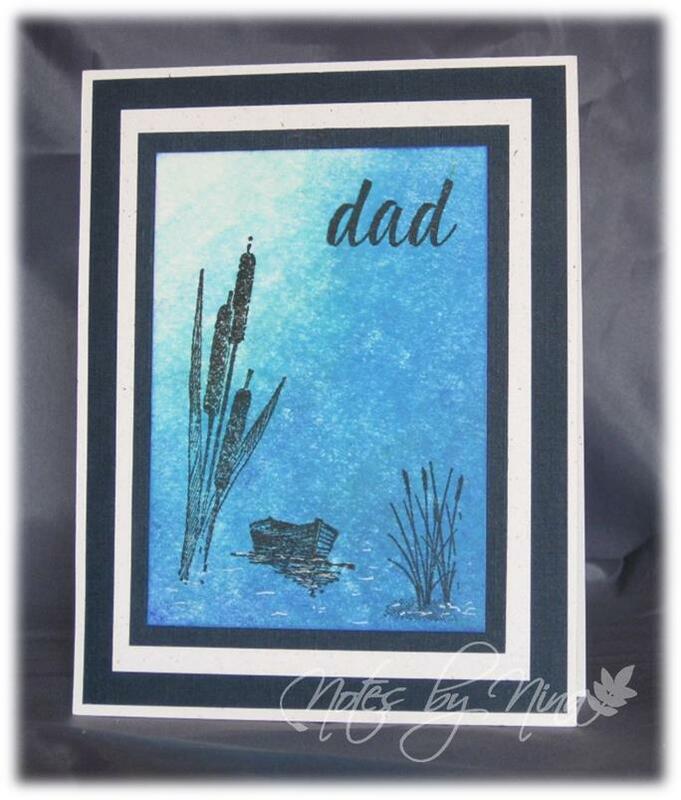 Supplies: Natural white and navy card stock, Rosewood-Bullrushes, Impression Obsession - Boat Corner, Stampscapes-Cattails. The Stamps of Life -words4family. Have a wonderful Saturday, you may just see me back here later :). I finally managed to get some time in my craft area last evening after being away on vacation for a bit. I did not realize how much I missed it till my got my fingers a little tacky with glue :). 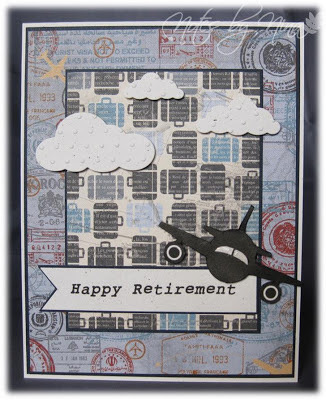 This card is for someone who is retiring but is really just jumping from one career to the next, the next is working for an airline. I dug out one of my 6x6 paper packs that had a travel theme, I found this great clipart airplane and fussy cut it out and popped it up with foam tape. I even added a little glossy accents to the wind shield. 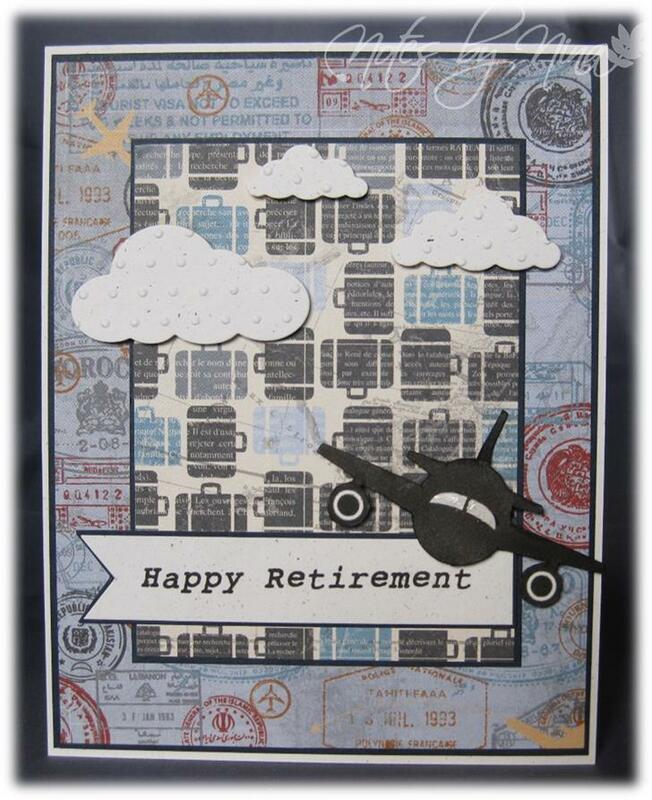 I used my Memory Box die cuts for the clouds and added a little texture with an embossing folder. 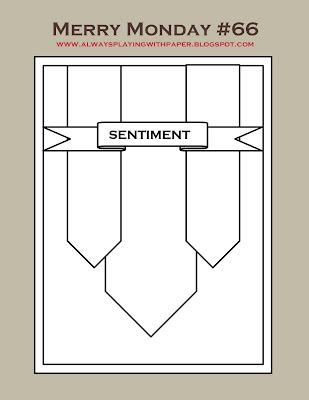 I finished with a sentiment that I printed from Microsoft Word. Supplies: Natural white and navy card stock, Designer Paper-Bo Bunny, misc airplane clipart, Memory box die cuts, embossing folder. Another weekend has come and gone, it seem to zoom on by too. It is time for a new Merry Monday Challenge. Lesley has great sketch for us. I changed it up a little, I was making chevron style bottoms on the element before I realized what I was doing, I did not want to waste the paper so I left them as is. 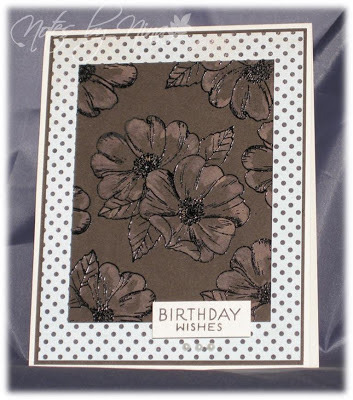 When I had the card put together is looked almost vintage to me, so I chose to do the same with the sentiment. 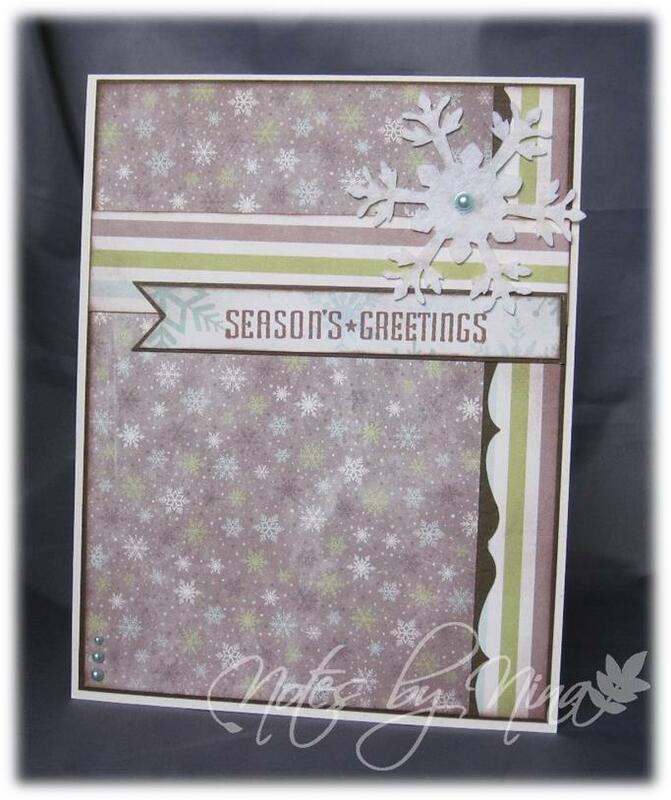 Supplies: Natural white and brown cardstock, Designer paper-Authentique, Cornish Heritage Farms - Vintage Christmas, gems. Good morning, can you believe it is June already. Are you ready for a brand new Merry Monday challenge, Lesley has created a fabulous sketch for us. 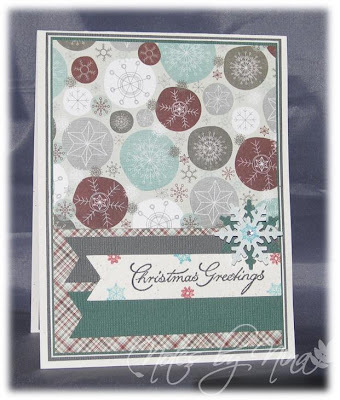 I like the layers of this card without adding too much bulk, it cost me a small fortune last year to maiI out my Christmas cards :). I found this felt snowflake in my supplies and could not resist adding it to my card and then I finished with some pearls. Supplies: Cream and brown cardstock, Designer Paper – Dovecraft, Cornish Heritage Farms-Vintage Christmas Felt snowflake, pearls.